I have been cooking dishes on the weekend that requires the use of culinary herbs. One thing that struck me was how expensive herbs are in the supermarket. A small box of sweet basil or rosemary will cost you $3.50. If you are roasting chicken, the herbs will make up one third of your cost. 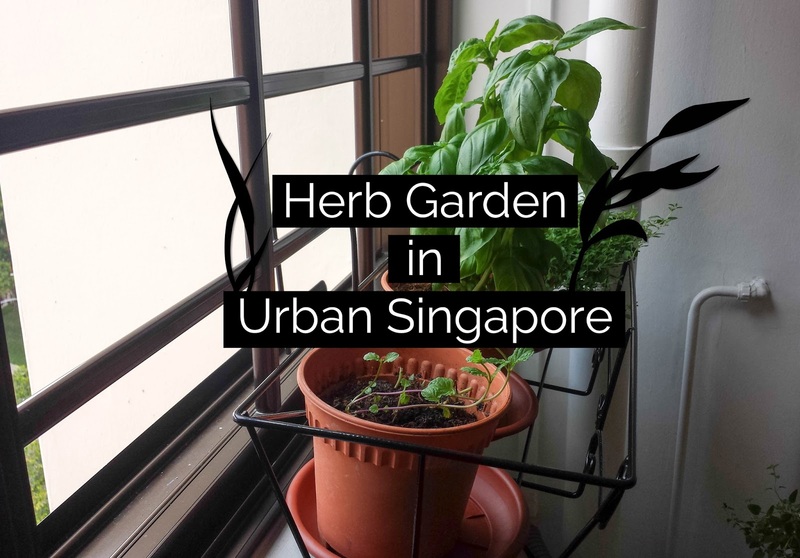 So I set out on a journey to find out where to buy herbs and plant them in an urban apartment in Singapore. I calculated that it will be cheaper once I get my herbs garden up and running. * I have a follow up post on the flowers of Kang Kong and Sweet Basil. Be sure to check it out for some amazing photos. 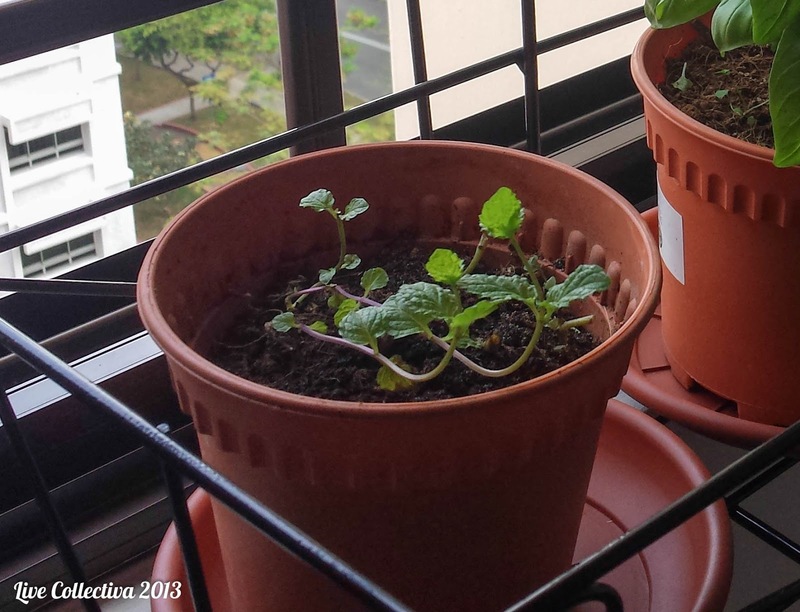 When I was researching into growing herbs, I found out that many Singaporeans have a passion for gardening. They post and share tips on forums (links at the end of this post for your own browsing leisure). Before starting this, I always thought that herbs grew in cooler climate because culinary herbs tend to be used in western dishes. For example, I have never seen rosemary being used in asian dishes. 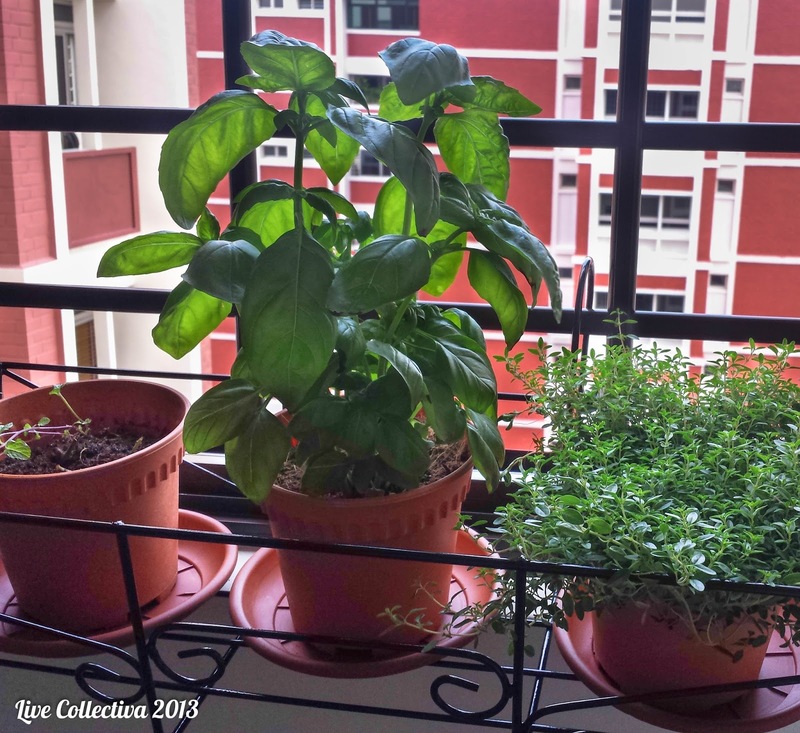 What I found out surprised me: Singapore's weather is good for growing a large variety of herbs. Our hot and sunny weather is like having summer all year round. There is no downtime like autumn and winter. If a particular herb does not like hot weather, grow them in a shady area. Gardening in an apartment has different challenges from an open-air garden where the sun shines directly above. The sun comes in through the window or balcony at an angle so you have to turn the pots regularly to shape the plant properly. Instead of having a garden bed of soil, you have to contend with pots. I found that the best method is use a hanging rack that can hang off the window sill or ledge. The pots are placed on the rack positioning the plant closer to the sun and they are easier to maintain at the shoulder level. There are three ways to acquire the herbs you need. The easiest is to visit a nursery and buy potted herbs. The two nurseries that I have been to are: Katong Flower Shop and Sinflora. 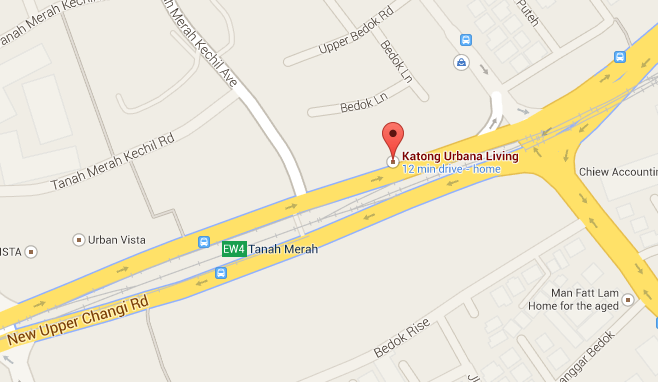 Katong Flower Shop is near Tanah Merah MRT station so it is convenient for those without a car. They have these herbs on my last visit: Sweet Basil, Rosemary, Mint, Italian Parsley, Oregano, Lavender and Tarragon. Each pot is around $8. The herb only make up a small section. They tend to focus more decorative plants. 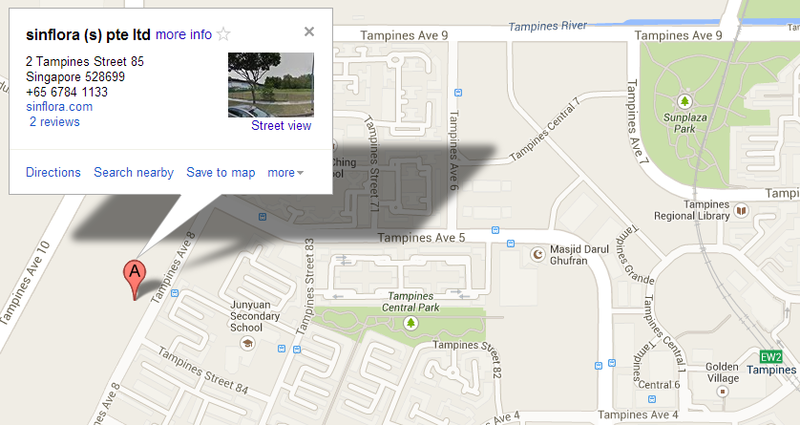 Sinflora is at 2 Tampines St 85 and you may need a car for this trip. Lugging bags of plants to the bus stop in hot weather can be uncomfortable. The herbs available here are: Sweet Basil, Thai Basil, Rosemary, Thyme, Capsicans, Chili Padi, Lime and Lavender. The small pots here sells for $10. The large pots goes for $18 where the height of the herbs reaches your torso. They have crazy big pots of Rosemary here which will look good when planted as a centerpiece of your garden bed. * Update 17 Jan 2015: One of the readers Rahayu left a comment that Sinflora is closing by the end of the quarter this year. I will definitely pay them a visit in the next few weeks. Maybe they will have items on sale. Between the two nurseries, I prefer Sinflora. Every pot here is labelled with the name of the plant and it's price. It is well organised and the herbs are vibrant and healthy. The cons is the remote location and higher price. I bought the hanging rack from Sinflora for $18. Both nurseries stock plastic and ceramic pots, potting mix, compost and fertilisers. I found sheep and chicken dung fertilisers at Sinflora. They also have deck furniture which is a great addition to the balcony. There are many other nuseries in Singapore so choose one that is nearer to you. When buying the herbs for the first time, pick up a bag of potting mix and some fertilisers. If you are cutting off your herbs for use regularly, you need to fertilise them once every two weeks. Also if the herb has been sitting in the nursery for awhile, the roots may have grown in a point where it is strangling itself inside the pot. You will need to split the root ball into two to four parts and replant the herb in potting mix. Some branches of Fair Price and Cold Storage have a section for plants and some herbs can be found there. If you have experience with gardening, you can consider growing from seeds. Growing from seeds mean less worry about accidental introduction of fungi or pests to your garden. You can selectively choose the cultivars of herbs you are growing. For example, there are more than 10 cultivars of oreganos and the nurseries won't have stock for all them. Seeds are sold in packets in nurseries or you can purchase them online. Eco City Hydroponics has an online store that sells a wide variety of herb seeds (52 different type when I last check). If your total purchase is above $100, they provide free delivery to your house. Planting from seeds is tedious work. It requires a sprouting medium and transplatation when the plants get bigger. It takes time and the result of every seed is different. A seed from a plant do not grow to be like it's parent. It is nature's way of ensuring variety. If you want a plant just like what you are seeing, use this method. Take a cutting of 6 cm from the parent plant, strip away the bottom leaves and plant it into the soil. Alternatively, you can dip it into a bowl of water and wait for the roots to grow before transplanting to soil. After about 2 weeks, the cutting will start growing roots and become a plant that is exactly like its parent. If you are not successful with cuttings, dip the end in rooting hormone to promote root growth. 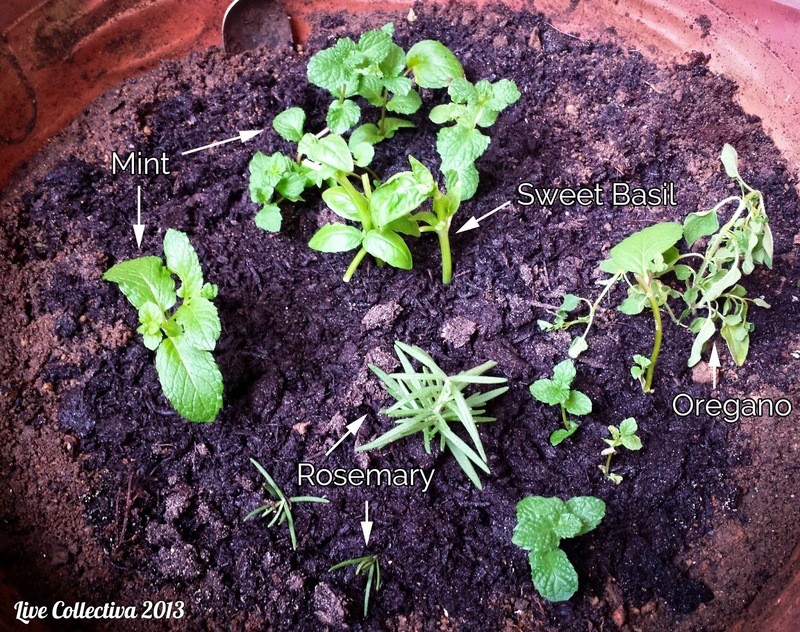 I have propagated mint, rosemary and sweet basil from the parent plants using this method. When propagating the mint plant, cover it with a plastic container for the first week. The mint leaves loses moisture easily and the plastic container prevents the cuttings from drying out. With so many herbs to choose from, which should you plant? I will introduce three herbs to you that is easy to maintain and easy to use with your dishes. This is my favourite herb. The leaves are thin, almost-needle-like and survives well in semi-shade. On a mature plant, the stem becomes woody. Despite it's scrawny look, it has a strong aroma that is released through the oil when the leaves are crushed. If you stick your face into the plant, the rosemary smell shoots right up your nose. Rosemary can grow to a size of bush, making it good for growing along the garden path. It requires little care and some watering only. If you forget to water it for two to three days, it shows little sign of dehydration. It is best to plant it in a fast draining soil. Cutting the herb back stimulates more growth. There are many uses for rosemary in cooking. When roasting whole chicken, stuff a few branches of rosemary inside the chicken with a whole lemon. The chicken gravy that drips out from the chicken has a refreshing rosemary flavour. When there is leftover, keep the chicken soaked in the gravy in the fridge. When you heat it again a day or two later, the rosemary-infused chicken meat will release flavour in your mouth giving you a high. I rate it excellent for a leftover dish. Apart from cooking, you can make Rosemary oil that is good for dipping your bread in. 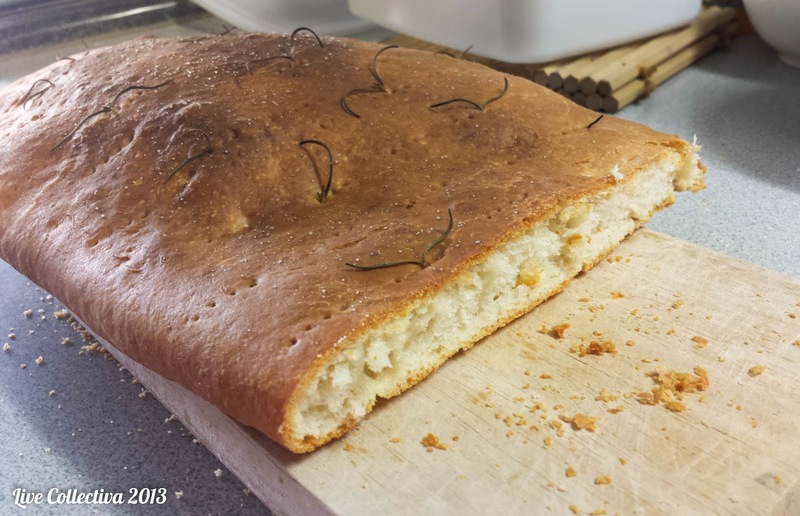 You can also make schiacciata with the rosemary sprigs. There are many different type of Basil plants. The one that is commonly used in western dishes is the sweet basil. The sweet basil has large dark green leaves with a distinct crumpled look. When the leaves are plucked, it has a very strong scent. The basil plant can get really big. If you trim the plant from the top, it will grow bushier. Plucking the leaves at the lower stem will result in a taller plant. A taller plant requires tying to a stick for support. Sweet basil needs lots of sunlight so stick the plant in the brightest spot in the house you can find. Fertilise once every two weeks as this is a plant that grows fast. Sweet basil can used for pizza toppings, salad and part of your pasta sauce (tomato and basil goes well together). It is a key ingredient in the very yummy pesto sauce. Sweet basil adds a strong flavour and does well in dishes that is sweet, sour or both. The best thing about growing your own sweet basil, you can be sure that there is no pesticides on it. Pluck the leaves off, give them a quick rinse and they are ready to be eaten. Mint is a hardy plant making it to more tolerant to mistakes for beginners. 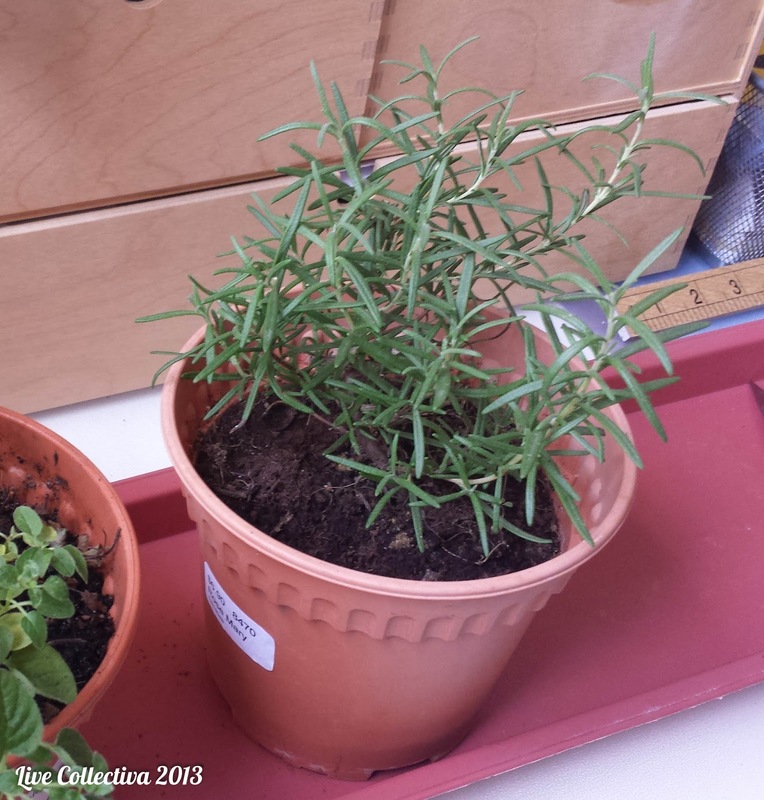 It likes moist soil and lots of sunlight. Because of it's leafy nature, it transpires a lot so water it twice a day. I once forget to water the mint for a day and the stalks collapsed. After watering, the stalks were standing upright within an hour. Mint's root will keep growing until it strangles itself in the pot. When it does that, it's time split the root ball into two. You can plant it into two pots or throw the other half away. Mint is good for mojito. Crush the mint leaves with lime, add rum/gin/vodka and sprite and you get an excellent cocktail. Mint is also great for salad dressings and light dishes that needs a fresh kick in the mouth. The small top leaves are also good for decorating the top of a dish or drinks. To set up the herb garden, I have spent around $80 which includes the herbs, potting mix, fertilisers and rack. The herb gives me great joy to look at and tend to when I wake up in the morning and when I come home from work. Finally, I like the convenience of having fresh herbs when I am cooking now.